I feel very happy today. Just had my first post-op appointment after surgery for an extremely rare but apparently non-malignant tumor in my head. It was totally removed by a very skilled surgeon trained in endoscopic skull-based surgery. After knowing it could be cancer which would require extensive and invasive surgery and reconstruction, I'm on the other side of this horror without even so much as an external scar! God is good! That's wonderful, SC. Sounds like you were in good hands. That's very good news! Get well soon! I am doing a little Happy Dance...Agents of S.H.I.E.L.D. has been renewed for another season. Starine wrote: That's wonderful, SC. Sounds like you were in good hands. Thanks, Starine. I am very fortunate and very very grateful! Thanks, Catalina. Recovery is slow but steady so far! I love watching Celtic fans suffer to death. When do the NBA playoffs start? 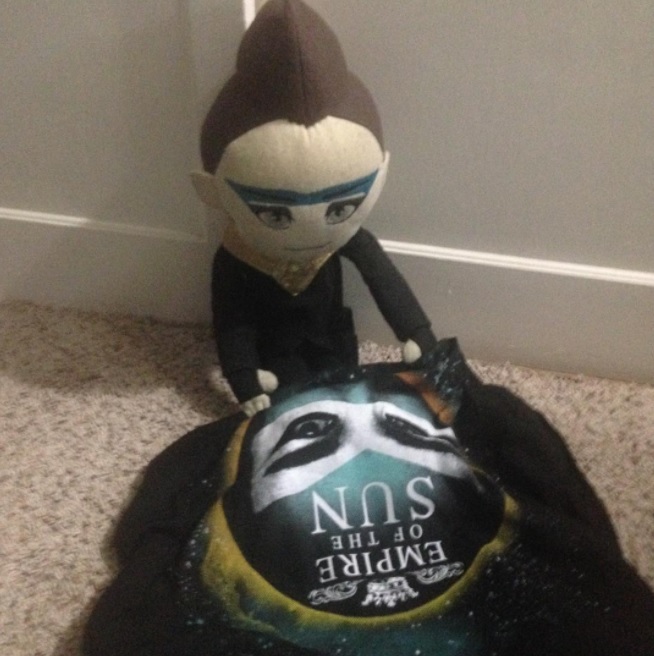 my shirt came today and i had a great photo op with my little plush Emperor. this shirt is way too big for him, so it's mine now. Without even really doing anything, I fell into the perfect postdoc, and now I have a desperately-needed year to figure my life out. Felt a little lucky and unworthy about it, then my boss gave me an inspirational speech about how "we make our own luck" and "I wouldn't have offered this job if you sucked." A raise, another year with my friends in Boston, Saratoga in a month and a break from the hard work until September... I'll take it. This forum really needs that dancing banana emoji. And this is far too belated, but so glad to hear that Sparrow Castle! I hope your recovery has continued to go smoothly. Tessablue wrote: Without even really doing anything, I fell into the perfect postdoc, and now I have a desperately-needed year to figure my life out. Felt a little lucky and unworthy about it, then my boss gave me an inspirational speech about how "we make our own luck" and "I wouldn't have offered this job if you sucked." Good for you lady. A year is so much time. Also, never feel unworthy. Who has time for that lol. I have a week off for the first time in over two years. It's still a few weeks away but wow. I can't wait. Ha thanks, an excellent point! Hope you have a great relaxing week. Been a good week: just got a $2000 bonus at my job and they honored my request for a 4-day work week, which I start next week. Time to buy a lottery ticket and find some long shots to bet before my luck runs out. I mentioned a while back that I was diagnosed with a fractured thorasic vertebrae (T5) which was causing great pain. Thanks to Catalina for putting me on to a procedure called Vertebroplasty. Had the procedure this past Wednesday, and I am totally pain free - at least in that area. The collective wealth of information on the internet is maybe the best thing about it. If you can winnow the diamonds out of the coo-coo-for-cocoa-puffs chaff, there are definitely a few gems. Congrats, Bal, Glad that your back feels better. I work as a preschool teacher and yesterday one of the little girls told me she loved me. I don't have any children of my own yet but I love each and every minute that I spend with these precious 4 year olds. I love to read to them, teach them their numbers and alphabet, watch them as they fingerprint during art, and sing songs with them. It feels great to wake up each morning and be able to say that I love my job. The work is not always easy but I love being able to make a difference in the lives of these young children. War Admiral wrote: I work as a preschool teacher and yesterday one of the little girls told me she loved me. I don't have any children of my own yet but I love each and every minute that I spend with these precious 4 year olds. I love to read to them, teach them their numbers and alphabet, watch them as they fingerprint during art, and sing songs with them. It feels great to wake up each morning and be able to say that I love my job. The work is not always easy but I love being able to make a difference in the lives of these young children. A strong candidate for post-of-the-year, Eclipse Award material or maybe an ESPY, congrats! We need more teachers like you, WA. Glad you find your work so rewarding.